I haven’t been posting recently. I haven’t been checking my blog actually for quite some time. I have been unusually busy with stuff. And I also have something new brewing in my life. They take up most of my energy and waking time. Anyway, since I am in a reflective mood tonight, I decided to do what I love to do during these moments, unload, blog. And I got a notification. The 1st year anniversary of my blog is here. I remember I started this blog last year when I was feeling unusually down. Something happened and I needed therapy. Starting a blog was the cheapest that I can think of that time. And now I reached the one year mark. A lot has happened. From being a keeper of my rants, fears and cries, this blog has evolved into my own personal, quiet space. One that I can always turn to when I need somebody to listen. One who will not say anything but will just take in everything that I want to pour into it. This blog has been my quiet friend. It’s weird thanking an inanimate but I will still do it. 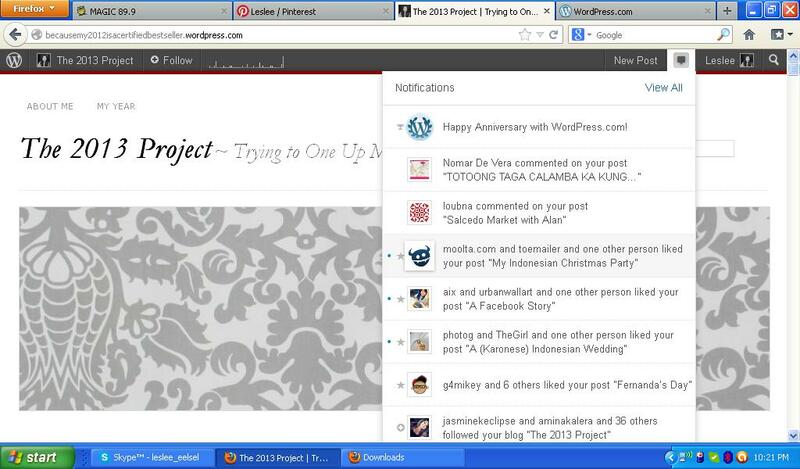 Thank you my dear blog for keeping my sanity (and insanity) for a year. We still have a long way to go. I am still counting on you.